I believe I mentioned in previous posts that Aunt Dottie made doll clothes are most of us girls. With Christmas coming up, I was thinking about what to make my adorable nieces Abby and Avery for Christmas. They love, love, love Frozen and I thought ..... 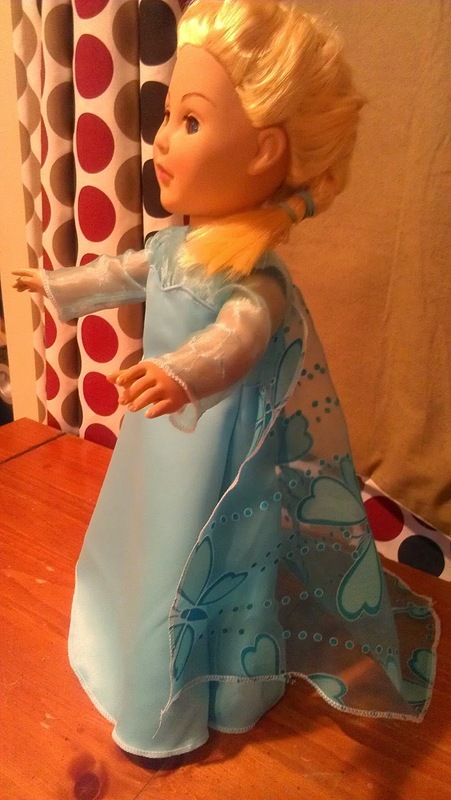 Frozen doll clothes. But first ... the doll. So I got online and looked at reviews for 18" dolls. Of course, American Girl dolls are all the rage, but I didn't want to spend several hundred dollars on each doll. The reviews I saw lead me to hunt for Madame Alexander dolls. 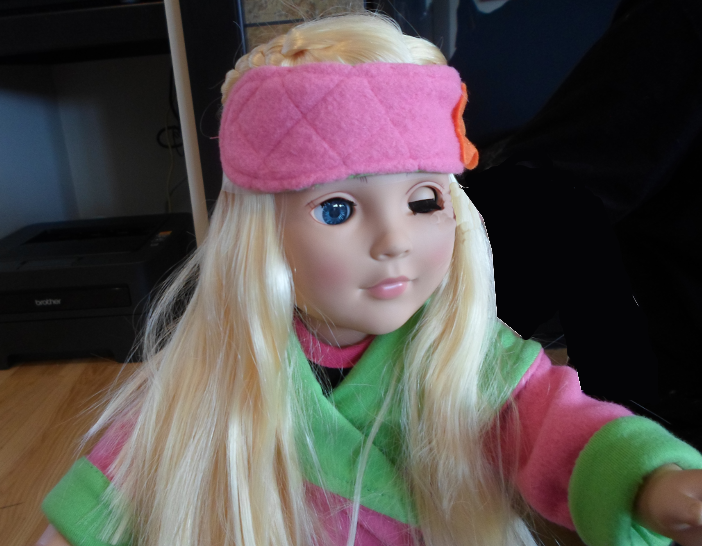 The Madame Alexander dolls are very close to the quality of the American Girl dolls. Going to the Madame Alexander official website showed these dolls sell for roughly $75.00 - still too expensive. Amazon was my next stop and I found a couple of dolls, last year models selling for $30.00/each. Sold! I found a blonde and a red head doll and received them the next week. I really wanted to make this pattern from scratch. 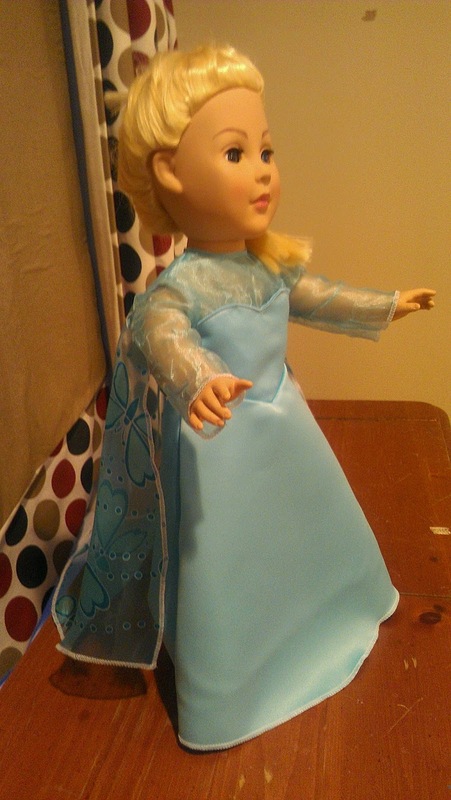 I failed in my Olaf design, so I set out using an 18" doll pattern as a base. 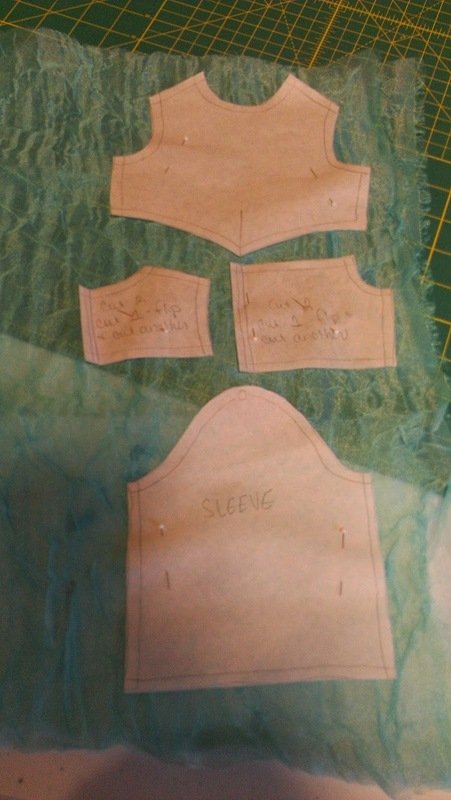 After several attempts with my muslin, I finally came up with this design. 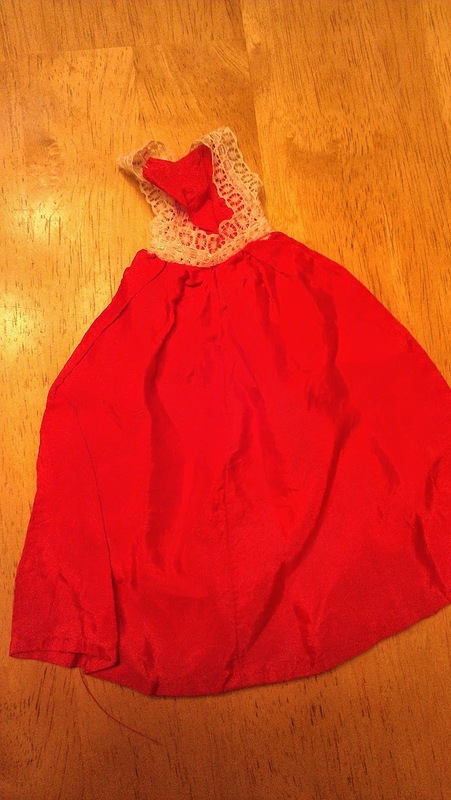 I wanted to also mention that my cousin Cindy recently sent me a barbie dress that Aunt Dottie had made for her. I was so touched by that gesture. So thank you Cindy .... from the bottom of my heart. I will treasure it. Next up! 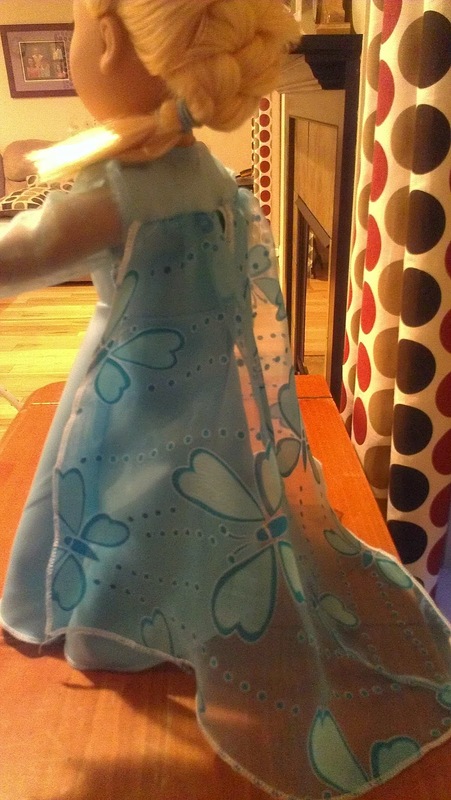 Anna .... the dress pattern is pretty much the same and the cape should be fairly easy. Over the years Aunt Dottie made barbie doll clothes for me when I was a child. And when I had girls she made barbie doll clothes for them. Sadly, none of them survived the years. It makes me sad to think of those lost treasures. I was thinking about Christmas and what to get my two beautiful nieces Abby and Avery. Abby LOVES Frozen. Did I mention she LOVES Frozen? Avery, while younger, shares her sisters LOVE. 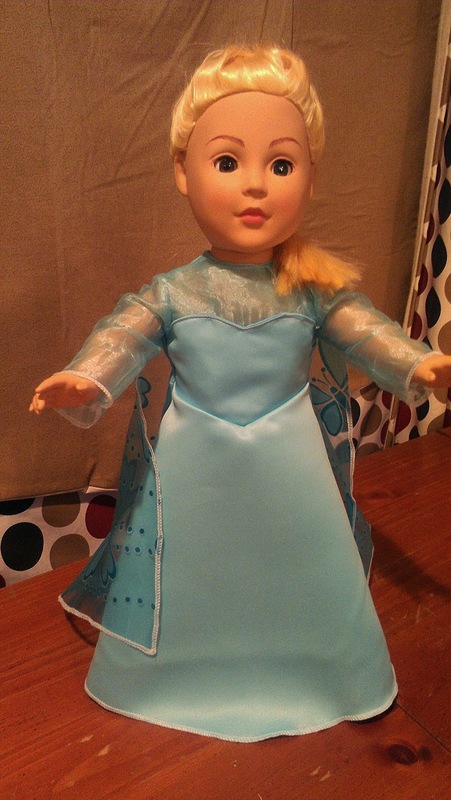 So my thought was to get Abby and Avery barbie dolls and make them some Frozen costumes for them. 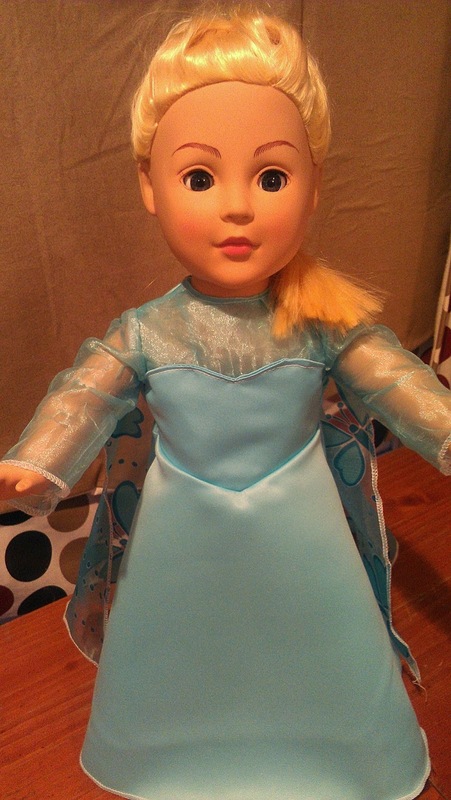 It then morphed into 18 inch dolls instead of barbies, but the idea was still there to create costumes for them. So then, I started to think about the other small beauties in my family, and began to think of Olaf. 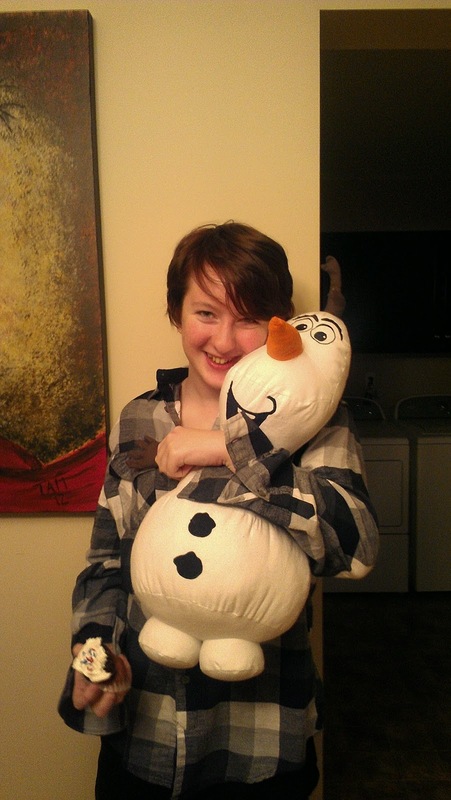 Wouldn't Grant, Matthew, and Lena love to have Olaf?! I began to look around at the different blogs about creating Olaf, but they all seemed to lack the full face and kind of 3 dimensional look. I tried several times to create the perfect pattern but grew frustrated very quickly. Why hadn't I paid attention in math!? I was ready to give up when Julia suggested I buy an Olaf and create the pattern from that. Good idea! 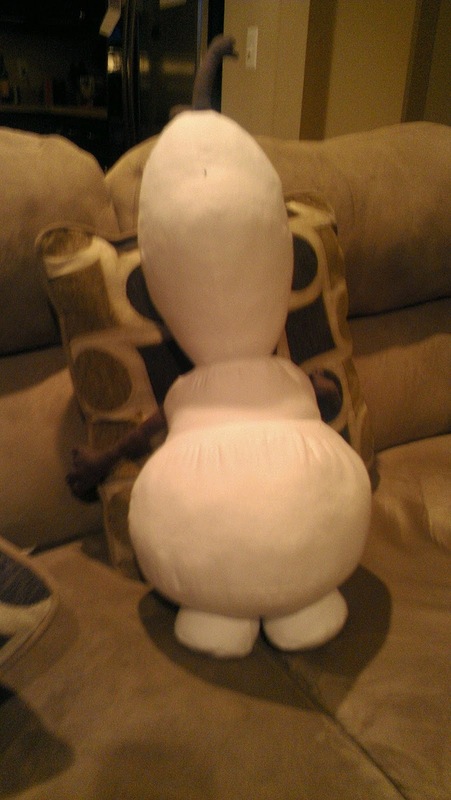 So off I went and began taking the purchased Olaf apart at the seams. 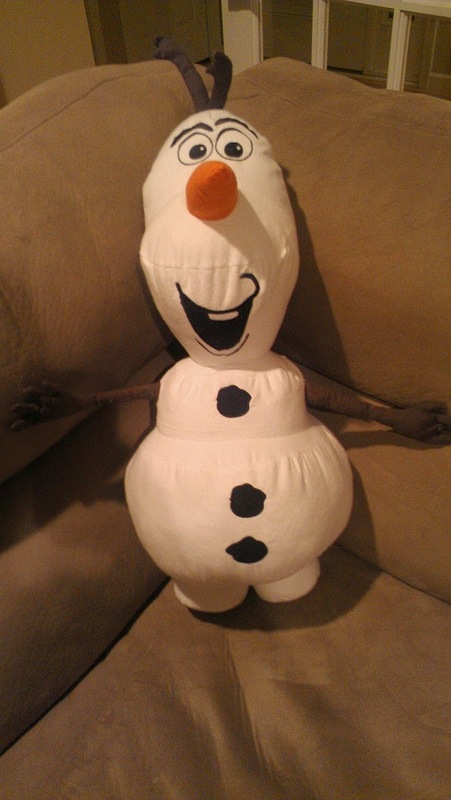 I redesigned parts of the pattern along with the eyes, buttons, and mouth for my Olaf. To add an extra touch, I embroidered the name of the child on the bottom of the foot. 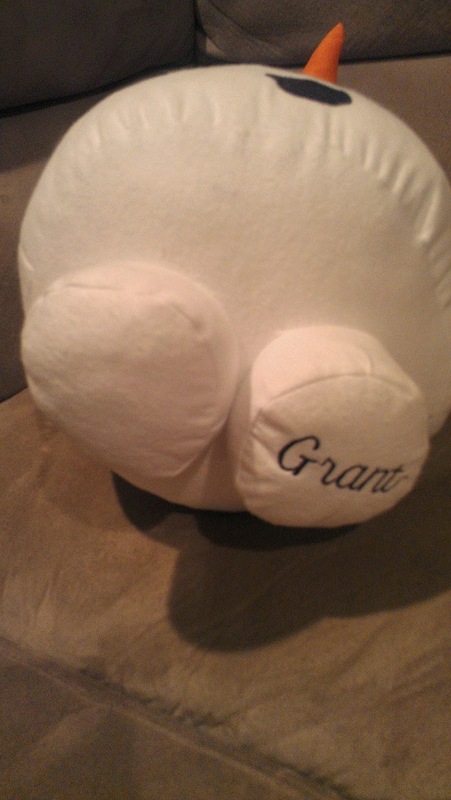 So Brandy, if you read this, Grant's Olaf should be on the way soon - just in time for birthday #2! 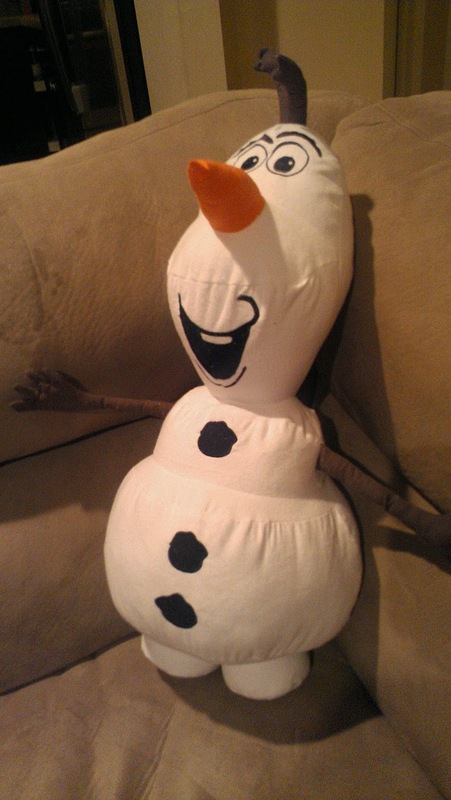 I actually finished stuffing Olaf while I was watching Frozen. Jackie came over for lunch and now .... well .... guess I'm making 4 in total. Julia loves Choir and especially loves her music teacher, Ms. Sarah Price - who I have to admit is pretty wonderful. 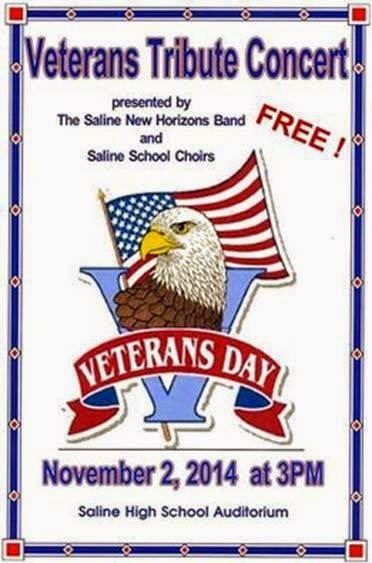 Julia was very excited and anxiously awaiting the Veteran's Day Tribute concert at Saline High School. She had to buy some new shoes for the concert. Her outfit requirements were black shoes, black pants, black shirt, and black blazer. My daughter Jenny and her are about the same size, so Jenny lent her the blazer. It's looks nice! Here's the outside the school, the performance arts entrance. The Choir had a bake sale to help send the Choir to Carnegie Hall in April. Everyone chipped in and brought baked goods to contribute to sell. Julia made Swedish chocolate balls made with some ingredients that her parents sent from Sweden. The line started to form outside the auditorium. The auditorium has 3 levels inside it. And the lower level where the Saline New Horizons band was already on stage. I tried several times to get a closer view of the choir and band together, but my camera just is so bad. Every picture turned out blurry. Julia spent extra time learning all the patriotic songs that we all learned from birth. Here's the artwork for the concert that was distributed around town. And here's the link from the Saline Post covering the concert. Thanks Tran! Aunt Dottie was very much into photography and I believe that if computers were common like they are now, she would have had fun with manipulating photos. I was awakened at 3AM by happy baby noises. I had put Matthew's bed in my room, and I stumbled out of bed to check on him. But the bed was empty. There it was again .... the happy baby noises. But they seem like they were coming from downstairs. I crept downstairs cautiously. I stood there astonished and absolutely amazed. I grabbed/ my camera and snap this shot. Matthew is only 4 months old.... We had just watched Adams Family 2 and I saw Matthew smiling at the baby Gomaz. Looks like he got into my Halloween paint. He looks just like him! 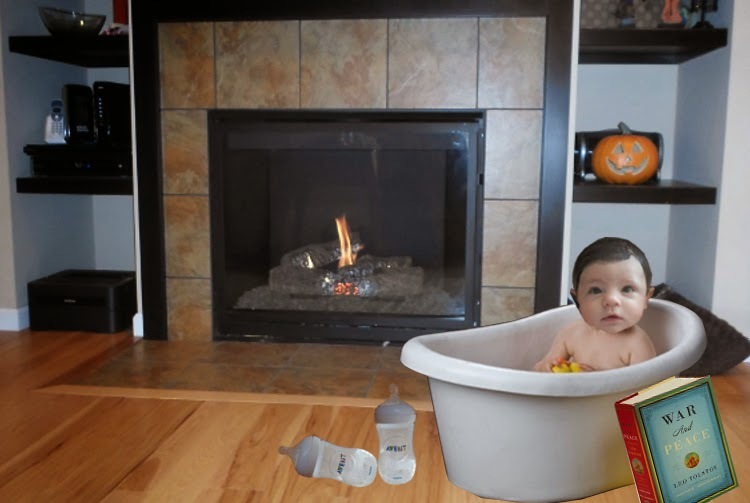 He finished off 2 bottles and did a little light reading while enjoying his bubble bath in front of the fireplace. How does he do it? I also noticed that the new doll I had purchased was out of the box and was nearby.